It's a great synth. Compact, USB powered and has a big sonic potential. Great product. Bought "refurbished" but would have absolutely no idea that this had ever had any previous use. It was absolutely spotless and packaged like a brand new machine. Everything works perfectly. Can't fault it. The UltraNova is a tremendous amount of synthesizer power in a small and affordable package! There is a wide range of sonic potential here for programmers. The key bed feels nice, and performing on the UltraNova feels great. The only letdown is with the UltraNova's connectivity. It boasts USB connection, as well as sp/dif, but both give me clicking and timing issues when used with a powerbook and iMac under two different versions of OS X! Also, the patch librarian is a joke, being the most buggy and user-unfriendly software I've used in a long time. This synth is only usable to me as a standard "through the 1/4 inch analog out cables", and nothing else. I've spoken to tech support and they can only point me to months-old beta drivers that simply don't work. If you can live without the modern connectivity Novation promises but does not deliver, there is no match for the synthesis capabilities at this price point. Even with these issues, I love this synth. Novation really created such a versatile and fun synth with the Ultranova. It can act as an audio interface, a vocoder, a midi controller not to mention a great synthesizer. When you think you have it all, they come out and release several free expansion packs. The early 90s dance and the updated vocoder patches are awsome. The synth has an intuitive menu layout, the arpegiator is a blast, and the patches are original. You can tweak the hell out of it easily with the software gui. I also use the Ultranova as my main vst software synth controller because of it's size and the encoders jive well with the software. My only complaint is it does not come with a good piano sound. I know it's a synth, but with all the patches, they could have thrown in a few good house piano sounds. Other than that, I'd say "get it". I absolutely love the ultranova! Incredible capabilities & sound quality, especially for the price. Also, the feel of the keys is perfect to me, & it looks so cool with the blue finish. It is said you never know how much you love something until it is gone. My first Ultranova was sacrificed for a rompler I needed for a new project. Once my Ultranova was gone, I realized how many of my recordings it appeared on. Ironically, my last piece featured 8 tracks of Ultranova as a means to say goodbye to it. The title of that track is "Never to Return". When listening to that piece, I knew I had to reconsider my sacrifice. So I had to get another Ultranova. It is unique to most synths with it's incredible sound design and colors. I play everything from rock to space music. It is so interactive that I realized I never used it's preset patches. I kept making my own! It has "returned" and all is right with my musical world. Thanks Novation, for creating a truly unique and now "irreplaceable" instrument. Build quality, including key action is exceptional... especially considering it is all plastic. Very impressed. The voicing is excellent, including all the waveform options, the lfo's, the number of envelopes, and the modulation matrix. Very well done. The filter is really really good. I like the extra large filter knob on the control surface. Please consider adding a comb filter. The editing software is wonderful and the graphics are really nice. A lot of people have complained about the unit not being multi-timbral. There should be enough dsp power on board to make it at least bi-timbral. Please, please, PLEASE consider making the Ultra bi-timbral. This would come at the cost of polyphony but even if the polyphony were to be half of what it is now, it would be worth it. Being able to layer two patches would raise the Ultra to an entirely new level... and breathe new life into this five year old synthesizer. I believe it would re-vitalize sales and make to synth more appealing to some potential users who may have otherwised decided against getting one. It would also further differentiate the Ultranova from the Mininova. I have both an Ultra and a Mini. In summary: wonderful synth. BUT... please considering adding: 1) Comb filter 2) Make the unit bi-timbral I doubt if anyone is really going to read this, but I am hoping that maybe someone will and that my suggestions as a longtime user of Novation products (I also have a Nova Supernova keyboard)... I'm hoping that my suggestions will at least make it someone who is in the position to say: Yes, that's a great idea... or No, that's a stupid idea. Thank you for listening. Its a great little synth. However its long in the tooth now and things have moved on but Novation have not. They seem intent on releasing hardware for other people sounds when they should have released a new synth or two with VST instruments also. I am sure the Ultranova could sound even better and more relevant for todays music but there is no new sound banks from Novation and no updates to firmware. I dont use mine much as I trying to use it in my DAW it always crashes my system. I thought long and hard before investing in a Novation UltraNova. I knew I wanted a keyboard with full size keys, but a small overall footprint. I also knew that I wanted a digital modeling synth, as these provide access to a complex and rich array of programming options. The UltraNova has an excellent (Fatar?) keyboard with full size keys, velocity and aftertouch sensitivity, making it incredibly expressive through playing. I've created numerous patches where subtle changes in playing can produce nuanced performances. The synth engine sports 3 oscillators. Each has numerous adjustment parameters, something found throughout the unit. In addition to the standard waveforms, it also has a rather impressive set of wavetables, and can use external audio in place of one or all of the oscillators. The modulation matrix is deep. Each patch has 20 slots, and many can be made to interact with each other in interesting ways. For example aftertouch can change the speed of the LFO which, in turn, can modulate the wavetable position. The effects are great. Each has a surprising number of parameters, and variable signal path selection can chain effects in series, parallel, or a combination of both. 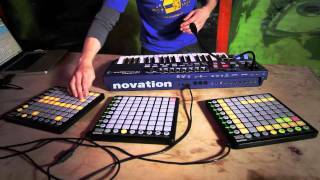 Also, the cost is shockingly great for the depth and quality provided by Novation. Also, UltraNova patches can now be ported to their new Circuit. I honestly can't think of anything I don't like. It is a bit strange using the computer-based editor. It is comprehensive and easy to use, but most be used as a VST plugin in a VST Host program. (I use Cubase.) Also, I'd love to be able to edit the wavetables, and even create my own. Lastly, it would be perfect if it included a formant filter. Still, those are minor gripes compared to the value. I like the product itself, but I don't feel that Novation does a great job of keeping the firmware on the product at a level that is future-proof. My unit continually has connectivity issues with my Mac. The Ultranova is my favorite synth. I love the flexibility with the different preset libraries. I can always get the sound I need. It's a supernova without knobs. We want more knobs!!!! Yesterday!!! Please please more knobs! I chose the UltraNova due to its sound and cost effectiveness. I needed a synth capable of three oscillator type sounds but was also reasonably priced. The UltraNova is exceeding all my expectations in creating the classic rock sounds my bands require. I highly recommend it. Perhaps there is no better VA Synth to sculpt sounds than the Novation Ultranova. I use it as a very dutiful MIDI Controller for my hardware synth modules, as well as a source for voicing VA sounds precisely. Here, the Ultranova earns the name electronic "instrument." The Ultranova is capable of reproducing virtually any sound from the analogue as well as a creating new ones of your own. Sound creation is so quick, intuitive and fun. The design of the Ultranova is clear, logical and clever. The potential of adding in free soundpacks makes it very comprehensive. The keyboard also has a nice feel to it, it's very playable. Despite it weighing only a few kilos it is anything but a lightweight. A deep expressive synthesizer with great editor and librarian. Probably the best value synth in it's price range. I have various keyboards / synths that cost a whole lot more than this, yet this synth is an absolute gem. I love it! Love my Novation Ultra Nova ! to me a novice easy to use has great sound shape options awesome presets and fun to use. The touch knob feature is a well thought out user fun. Full size keys for my hands is well appreciated, rshap32645. UltraNova is Novation's most ambitious synthesiser to date, enhancing their legendary SuperNova analogue-modelling engine to vastly increase its sonic range and vocabulary. The result is an instrument geared up to create sounds unmatched by any other in its class. At the core of UltraNova's synthesis engine are three insanely powerful oscillators, each capable of outputting both classic analogue waveforms and cutting-edge wavetables, for an enormous and diverse palette of raw signals. Noise and ring modulation are on tap, too, for further enriching of the oscillators, and with up to 18 voices of polyphony, even the most complex lines and chords are perfectly playable. A synth lives or dies by its filters, and UltraNova's are up there with the best you've ever heard. There are two onboard, both of them resonant, routable and offering low-pass, high-pass and band-pass modes at 6, 12, 18 and 24dB/octave. The modulation matrix lets you connect each of UltraNova's many mod sources to whatever target parameters you like, making almost any sound you can imagine a reality. But if sound design isn't your thing, don't worry – Novation regularly release free soundpack updates, containing loads of inspirational new patches. As if being one of the finest synths ever made wasn't enough, UltraNova also features a built-in audio interface, for effortless capture of its output in your DAW. Simply connect it to your Mac or PC with a USB cable (which also supplies power and MIDI I/O) and hit record! And that's not all: there's a 12-band vocoder in there as well, for robotising your voice and processing it with UltraNova's filters and effects via the included gooseneck mic. Let your sound design imagination run riot with UltraNova's three virtual analogue/wavetable oscillators, endless modulation possibilities and 18 voices of polyphony. UltraNova's Italian-made, 37-key Fatar keyboard features aftertouch and plays beautifully.